I’ve got to tell you something. As a designer, I do not follow a playbook. I don’t follow a connect the dots program either. There is not a step by step book which guides me during room transformations. And this is a good thing. I am a creative type and if I were bound by an instruction booklet throughout the day I wouldn’t know what to do with myself. This being said, there are some guiding principles that I follow that I will share with you below. If you implement some of these, your decorating experiences will have positive outcomes and hopefully should be fun too. 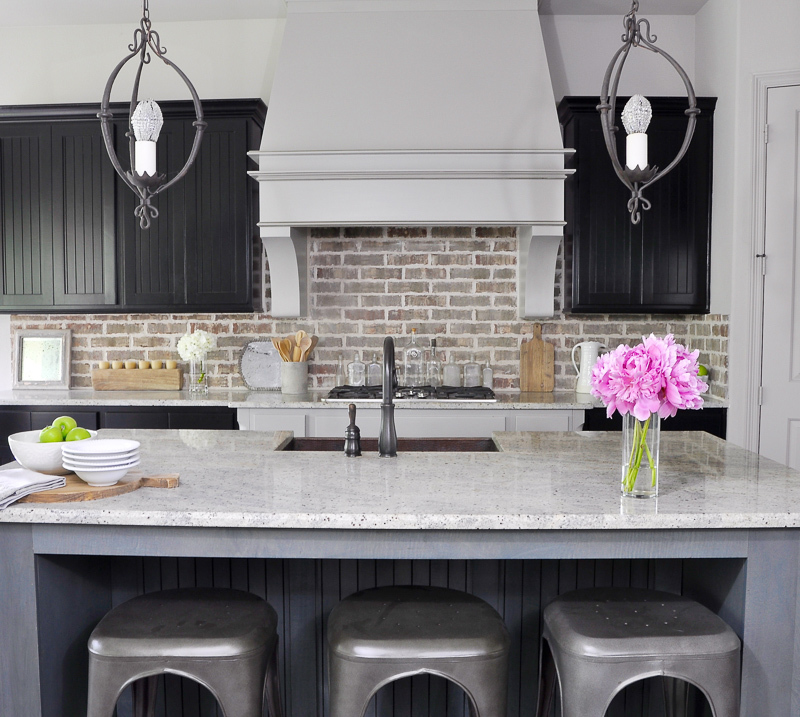 Pick a color scheme – You want at least one common color which is prominent throughout the home. Consistency here is vital. This will help the flow of the home. 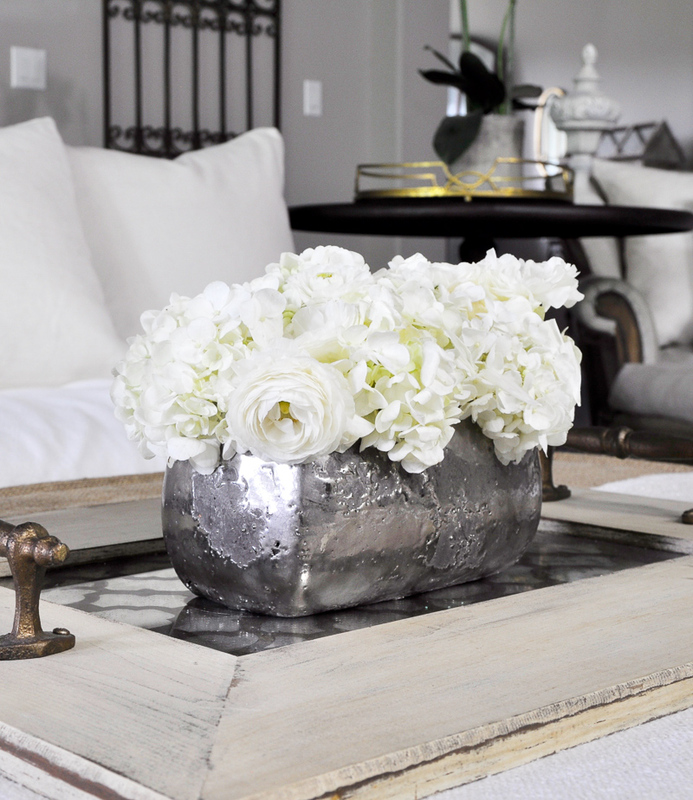 In our home, light neutrals featuring grays and linens are in every room of our home. You can see this from the moment you step inside. Select properly scaled furniture – Your furniture needs room to breathe. You will be better off using fewer pieces of a higher quality rather than overpopulating the space. The same holds true for accessories. Less is more and odd numbers seem to show better than even numbers when it comes to groupings. A good rule of thumb: if the item is smaller than your fist, it is probably too small. Hang art at correct height – One mistake I routinely see is art hung at the incorrect level. For most pieces, the midline of the piece should be at 60 inches above finished floor. The average human eye level is 57 inches. This piece is new in my home and I want to tell you a little bit about it. I have dreamed of having a painting of a church for a long time, but I could never find the right piece…until now. I found @deannart on Instagram and was immediately enamored by her style and color palate. I absolutely adore the muted details which offer intrigue and mystery in every piece I’ve seen. One tidbit I must share with you: she traded in her high heels and corporate job for boots and brushes. How cool is that! You can find this piece, Redeemed here. 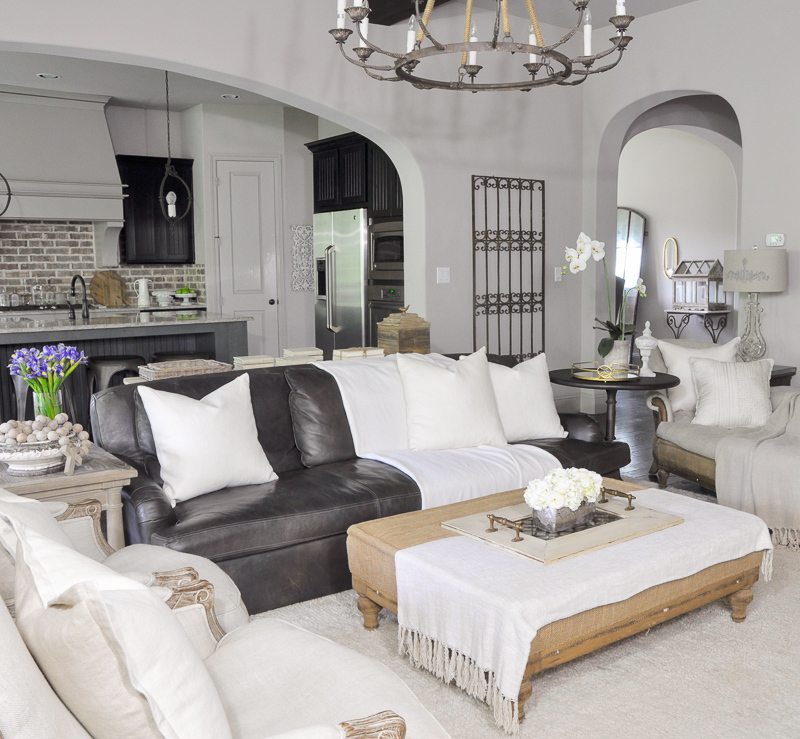 Incorporate a beautiful focal point – Each room in the home will have a focal point. It could be a headboard in the bedroom, the vent hood in the kitchen, or something wonderful above the fireplace. In each case, your eye will go straight to this item. Embrace this and decorate around it as each room will have a star and supporting cast. Avoid being too trendy – If you are a fan of HGTV’s “Fixer Upper” you certainly have heard the term shiplap. 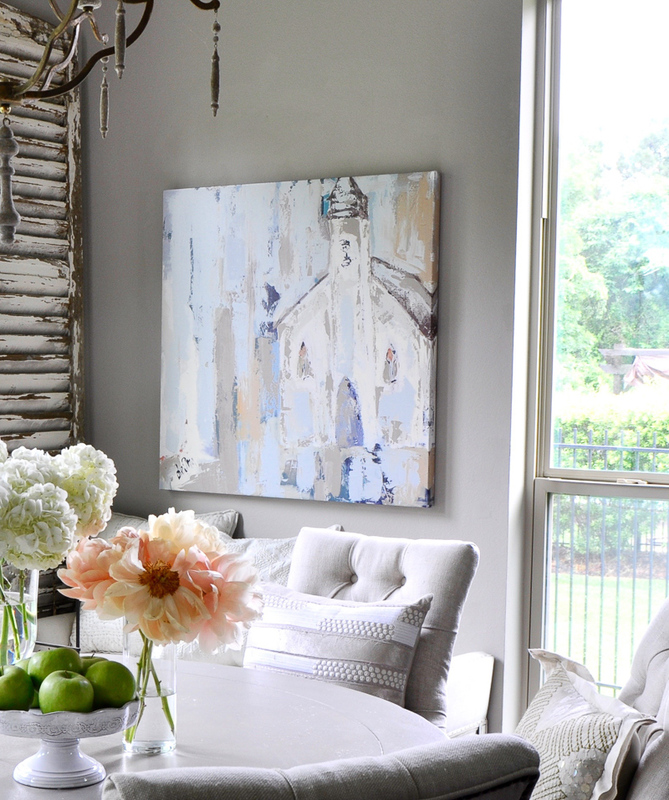 You may love shiplap. By all means, if the style of your home does not support it, please resist the urge to install shiplap or any other material that does not fit within the overall design theme of the home. Instead, use accessories to add trendy items to your home so you can switch them out with ease. Above all else, embrace your creativity and stay true to yourself as well as the room’s personality. Remember, design is a process and your home can and always will be evolving. If you can implement some or all of the above tips you should see the benefits and your design experience will be more in line with your vision. « Is The Family Room Your Shining Star? Thank you so much Tamara! I think that was everyone’s favorite tip and it’s definitely mine too!!! Great tips Jennifer! I am busy redecorating and rearranging this weekend, so these will come in handy! Hugs! I totally agree that when designing a room you need to be sure to have a focal point like the vent hood in the kitchen you mentioned. My sister is currently trying to update her home and this article was so helpful for inspiration on how to choose home decor to look for in her own style. I will have to mention what you said about a focal point to her as well as the rest of your article. Thanks for your suggestion to decorate with a certain color scheme in mind. I like your comment to put art up in your rooms and hang them at an eye pleasing level. I am considering buying home decor accents to update my bedroom. Good luck with your update! Thanks for these design tips. I like how you mentioned to embrace the focal point of the home and to decorate around it. I’m a bit interested to see what designs people have come up with by focusing on this concept, and see how each one is unique to their own home.